Much to the excitement of music fans worldwide, Kinks legend Dave Davies will be releasing a new live album titled “Rippin Up New York City: Live at the City Winery” on September 4, 2015 on Red River which is distributed by Sony/RED. The recordings were culled from two exciting live performances by Dave and his band in NYC in November 2014. “I’m very excited about the live album and the band sounds great. my son Simon did a great job helping me with the production. I look forward to seeing you all on the road this fall”, said Dave. Nearly fifty years after influencing generations of guitarists Dave continues to rock and tour. His 2013 return to the U.S. to support the album “I Will Be Me” was a triumph both creatively and spiritually as he found new inspiration for his soon to be follow up album, the highly acclaimed, “Rippin Up Time”. Released in 2014, Dave embarked on yet another U.S. tour to support it. He was joined by Jonathan Lea on guitar, Tom Currier on bass and keyboards and legendary drummer Dennis Diken of the Smithereens. The tour swept through venues in Milwaukee, Chicago, New Jersey, NYC and many more. Jim Sclavunos played drums for one gig in Bethlehem, PA. On every date Dave Davies and band played a highly charged set of solo album favorites, Kinks classics and new tracks. 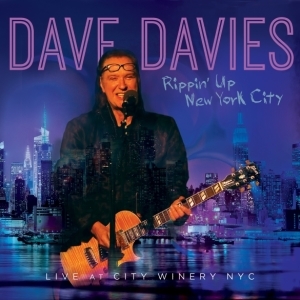 At the City Winery NYC on November 24 and 25, 2014 Dave and band put on an amazing concert to an audience of new and longtime Kinks fans, music industry stars and legends. They delivered two exhilarating nights of performances that rocked and ripped up the city’s nightlife. “Rippin Up New York City: Live at the City Winery” captures the live electricity of turbo charged rockers along with delicate and sensitive versions of acoustic favorites from past and present. A true genius who never fails to deliver, this Dave Davies live recording expresses the power, sensitivity, magnetism and creative expression of a seasoned yet spontaneous rock-n-roll visionary.